Many careers start with a traditional two or four-year education, but a career as an independent claims adjuster isn’t typically one of them. There’s a reason why one of the questions we’re most commonly asked is, “How exactly do you become a claims adjuster?” While most of us are introduced to career ideas like teaching, firefighting, and even accounting, many times, you might not consider claims adjusting as an option until you actually meet one. As long as there is insurance, though, there will be claims adjusters, making this one of the more stable career choices out there. So how do you get started? Independent claims adjusting is cyclical, and not necessarily regular, as it depends on catastrophes and events. You have to be healthy enough to not only climb up on rooftops and walk around claims sites, but also to maintain long hours when you are working, in order to maximize the opportunity for income. At the end of the day, you’re working with people, and often with people who are stressed out about the loss they have experienced. Your job is to listen to them as well as to communicate to them what you’ve found – including if their insurance company won’t be covering their loss. Do your research, and talk to claims adjusters you know or who are in your network. Like any career, talking to someone in the industry is one of the best ways to determine if it’s for you. Before taking and passing state exams and obtaining your licenses, it’s crucial to prepare by undergoing the proper training. Much of claims adjusting work is highly technical, and a great course will properly teach you the skills you’ll need for your licensing exams and for when you’re on the job. These courses can be taken either online or in-person – make the choice that best works for your learning style. Whatever you do, don’t skip the Xactimate training. Identify the states you want to work in, and start researching their licenses and licensing fees. If you plan to be a catastrophe claims adjuster, make sure to plan for licenses in states most affected by hail, tornadoes, and hurricanes. Texas is the most popular Gulf State license, followed by Florida. These licenses also take longer to obtain than other states. Plan accordingly. You can also get licensed in fire, auto, and water: go where your strengths are. It’s best to ease into claims adjusting, rather than jumping in full time. Join the National Association of Catastrophe Adjusters, and start networking. Ask if you can accompany experienced adjusters on the job in order to get some experience. 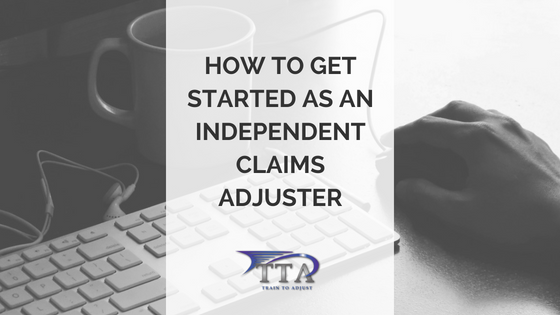 Find independent claims adjuster firms and get on their rosters. Build your experience before jumping out there full-time on your own.